Our Flexible Duct is a PTFE product that works well for any chemical environment or when large axial movements are required. The support systems maximize the open cross-sectional area during large axial movements to avoid collapse and restriction of air flow. 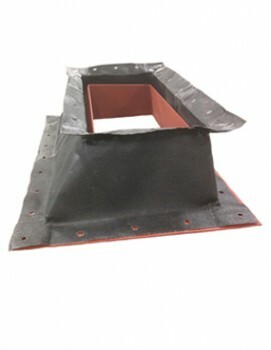 The Flexible Duct product has a maximum temperature range of 600°F (316°C) and can be used in any wet or dry application, regardless of chemical exposure. The material is unaffected by UV exposure and will not support fungus growth. It can also include an optional electrically conductive surface material to prevent build-up of static charge. Some typical applications include clean rooms, chemical plants, food plants, fume exhausting and control, high temperatures, pharmaceutical, and pollution control. Call us today to discuss your application and if this product is your best choice. FS Products supplies a variety of sleeve sizes and configurations. A sleeve connector is a flat piece of material that is heat sealed, or bonded, at an overlapping splice seam to form an endless loop that can be slipped over each end of a plain pipe or duct. Our sleeves can be provided in any of our materials to accommodate movements, chemical attack, or high temperatures. 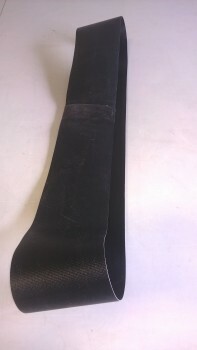 We can also provide transition sleeves or rectangular sleeves, depending on your specific application. 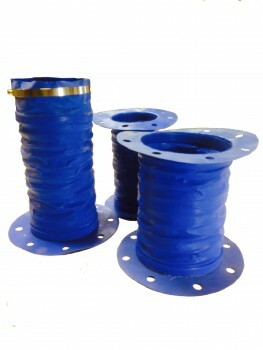 We often provide band clamps to attach the sleeve ends to the piping or ducting. Our standard clamps are ¾” wide stainless steel T-Bolt band clamps. Sizes larger than 12” diameter will often require multiple latch locations to achieve a tight fit. For airtight applications, we suggest gaskets. Our engineering staff is always available to see which configuration will work best. Contact FS Products today.